Even the best sun safety practices are not a guarantee that you will not develop melanoma. Both your genes and your environment play a part in determining your risk. By catching melanoma early, however, you can help insure that it will not do you serious harm. Melanoma caught early is highly curable. Survival rates decrease dramatically when it is caught at later stages and has spread to other organs. Check your own skin once a month. Get to know the pattern of moles, freckles, and other marks on your skin. Although no one is immune to skin cancer, some people are more susceptible than others. It has been known for a time that redheads have a much higher risk of developing melanoma. Researchers have recently begun to determine why. They have identified a "red-hair gene" that increases the likelihood of cancer-causing genetic mutations. Although redheads, who have two copies of the gene, are most visibly at risk, even those with a single copy--that is people who do not necessarily have red hair but may have light skin and/or light colored eyes--are also at greater risk. Have any worrisome moles? Keep tabs on them with Mole Mapper. Download the free Mole Mapper app to your iPhone or iPad. Mole Mapper allows you to photograph, measure, and track your moles over time so that you can easily become aware of any changes. Keep your data private or share it with researchers and help create a database that could make Mole Mapper a screening and diagnostic tool. Beauty salon professionals, you might help save a life! The Melanoma Foundation of New England offers a free online training program for hairdressers, nail technicians, aestheticians, and others who work in the beauty industry. 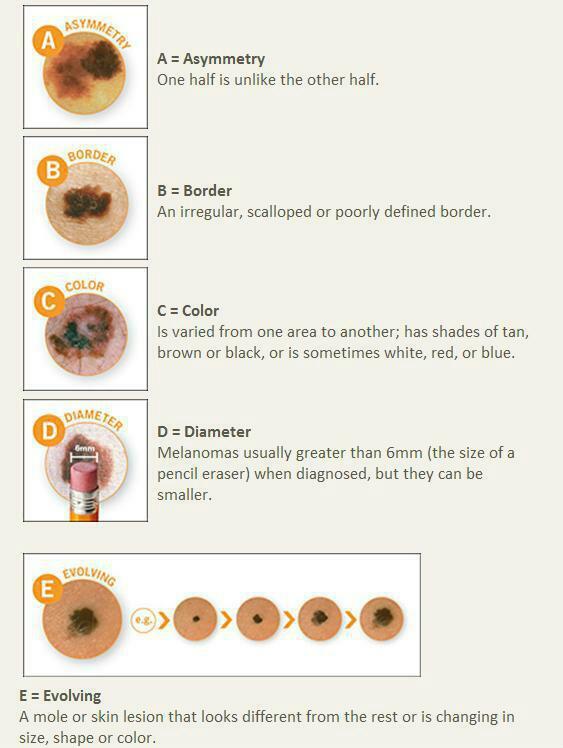 Just an hour of your time will certify you to help detect skin cancer at an early stage. You will learn how to identify moles that might be suspicious and how to talk to your clients about them. The program is free of charge and can be completed at your own pace on your home computer. Share the news with your stylist, nail technician, or skin professional. Let us know if your salon becomes certified so that we can spread the word that you are trained to help save lives! Melanoma is diagnosed through a biopsy. The suspicious growth is removed and sent to a laboratory where samples of it are examined microscopically. There are several different ways a biopsy can be performed. If melanoma is suspected, an excision biopsy, which removes the entire tumor, is usually recommended.